Lyra Ferby and Super Ferby Graphite Pencils are a brilliant choice for younger or left-handed artists. These chunky pencils have a 10mm diameter and a triangular shape to make finding the correct grip super easy. This ergonomic design allows for hours of tireless drawing! Each pencil has a wood sealed end and an extra thick, break-resistant lead. The Ferby and Super Ferby are identical, apart from their length. 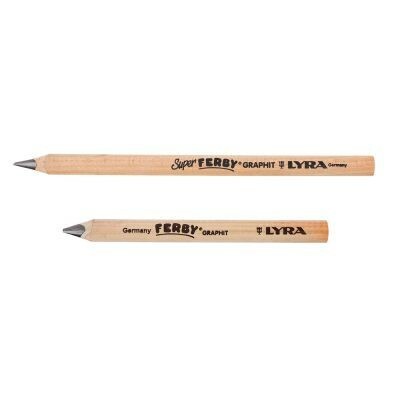 The Ferby pencil measures 12cm in length and has a slightly slimmer nib with a diameter of 6.3mm. The Super Ferby is longer at 17.5cm and the lead is a little thicker at 6.3mm in diameter. Both pencils are available in HB grade.